A Fall afternoon on the Slack Hill Trail. Summer is over, here at the October Country Inn. Clear skies and cooler weather usher in the changing of the forest’s colors from brilliant greens to muted reds, oranges and yellows. This will soon turn to white as the temperature continues to drop and Winter’s snowfall sets in. We’ve been putting off an afternoon’s exploration of the Slack Hill Trails all Summer, and realized that window was soon to close if we didn’t seize the moment. The Slack Hill Trails in Coolidge State Park are a short drive from here. The entrance to the Park is a narrow, steep paved road leading off of Route 100A about 6 miles south of Bridgewater Corners junction at Rt. 100A and U.S. Route 4. The trail can be accessed from the Park entrance station, or a mile up the park road across from the picnic area. The trail is well-marked with blue blazes, and is easy to follow, even when the entire forest floor is covered with a blanket of fallen leaves. When starting at the park entrance station trailhead, the trail climbs moderately through the mixed hardwood forest for about 1/2 mile when you will come to a marked junction. A signpost shows the way to a .3 mile spur trail that returns to the park entrance station. The main trail continues in the opposite direction climbing moderately in places before descending a short distance to a vista overlook near the 2,174 foot summit of Slack Hill. A log bench invites you to take a break. The summit of Mt. Ascutney is seen in the distance. Leaf covered Slack Hill Trail winds through mixed hardwood forest. The trail continues, alternately climbing and descending, for another mile to the picnic area parking lot. It’s another .8 of a mile downhill along the paved park road back to the starting point for a total loop distance of 3.2 miles. A 2 mile out-and-back to the Slack Hill vista point option is to start from, and return to the picnic area trailhead. Or, the loop option can be extended from the point where the trail meets the picnic area road by picking up the CCC trail and following it back to the park entrance station for a total loop distance of 3.6 miles. The park is open year round, snowshoeing or cross-country skiing is a Winter activity option. During the Summer, a day use fee may be charged. First Vermont Spring wildflowers along the trail. A couple of days short of Memorial Day here at the October Country Inn and, after a few days of light rain, a spot of warm weather has settled in. Our world has exploded in green. Seems like in a week’s time, the maples have leafed out, lilac and apple trees have bloomed, and roadside weeds are knee-high. Before this crescendo of botanical abundance, a mere couple of weeks ago, only the hardiest of Vermont’s Spring wildflowers decorated the trailside. Trout-lilys (Erythronium americanum) were the first to appear. The name comes from their leaves that resemble the color and pattern found on native brook trout. Trout-lilys are native to north-eastern woods and grow in colonies that can be 300 years old. 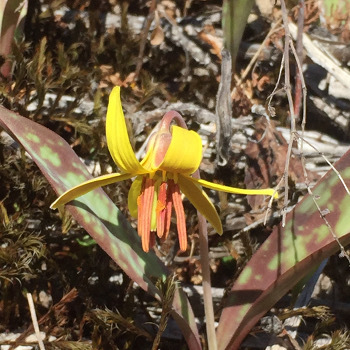 The Trout-lily is a myrmecochore, meaning ants help to disperse the seeds and reduce predation of the seeds. To make the seeds more appealing to ants they have an elaiosome which is a structure which attracts the ants. 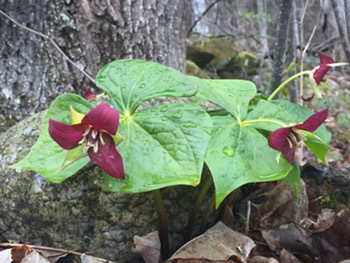 Another early bloomer is the purple trillium (Trillium erectum). It is also a native to north-eastern woodlands. It is a spring ephemeral, a herbaceous perennial whose life-cycle is synchronised with that of the deciduous forests where it lives. Its name is derived from its three lobed leaf arrangement and a flower with three petals. Lastly, the small but mighty common blue violet (Viola sororia) grows low to the ground and can be easily overlooked. 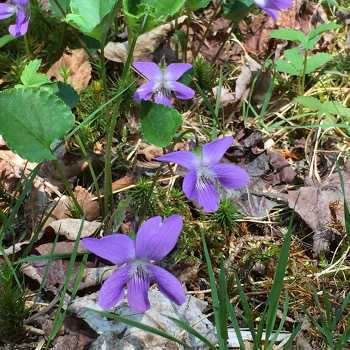 Also called wood violet, or the lesbian flower, it is also native to north-eastern woods, and is the state flower of Illinois, Rhode Island, New Jersey, and Wisconsin. This plant has historically been used for food and for medicine. The flowers and leaves are edible, and some sources suggest the roots can also be eaten. The Cherokee used it to treat colds and headaches. The common blue violet is also called the lesbian flower because in the early 1900s, lesbians and bisexual women would give violets to the women they were wooing. This symbolized their “Sapphic” desire, so-called because Sappho, a Greek lyric poetess, in one of her poems described herself and her lover as wearing garlands of violets. This practice became popular in the 1910 – 1930 time period, and has become a substantial symbol for lesbian and bisexual women in the modern era as well. Killington launches a new loop trail. A view of the Ottaquechee River marshland looking northeast. It’s been warmer than usual at the October Country Inn for this time of year . It seems like the leaves on our maple trees started to get their fall color overnight. It was cooler today. A quiet Sunday. A good day to walk in the woods. We’ve been hearing about a new trail, the River Road Loop Trail, the town of Killington had been working on and we took this opportunity to explore their handiwork. The 4.1 mile trail circles a section of the Ottauquechee River marshlands. A good place to see moose. To get to the Killington River Road Loop trailhead from the October Counry Inn, head west on U.S. Route 4 from Bridgewater Corners for about 10 miles. After about 6 miles you pass Killington’s Skyship Gondola Base Station on your left. Route 4 then runs straight and flat up a narrow valley. You will see the highway begin to climb up ahead, and then you will pass Goodro Lumber Yard on your right. River Road is the first right past the lumber yard. River Road is a narrow two-lane road that is paved for about the first mile and a half before turning into a typical Vermont hard-packed dirt road. Just before turning to dirt, on your left, the Killington Town office and recreational area offers spacious parking. Park there. Edie and Jenny take a break alongside the River Road Loop Trail. Start the hike by retracing your route for about .8 mile back down River Road. This is easy walking on River Road’s flat, paved shoulder. The Ottaquechee River marshlands border the road and offer a variety of wildlife viewing opportunities. Moose have been known to frequent the marshy area. There are beaver, and a variety of wetland birds including the great blue heron lurking in the reeds. The marshy area will end at a stand of hardwoods, and a “Killington Loop Trail” sign will then point the way to your right down a dirt driveway. Bear right on the double-track road the driveway will lead you to. You begin your walk through the woods on the double-track road until another “Killington Loop Trail” sign posted just before a large gated chain-link fence points you to the right once more, and onto a single track trail through the woods. A section of single-track trail meandering through the mixed hardwood forest. About two-thirds of the loop trail is this, mostly flattish, single-track trail meandering through a mixed hardwood forest that forms the southern border to the Ottaquechee River marshland. You won’t see much of the marsh from this side except for one spot at the edge of the woods where a recycled Killington chairlift has been converted into a bench swing. Take a break and enjoy the view. About a half mile further, the trail comes out on Thundering Brook Road. To complete the loop, turn right for a short distance on this dirt road before turning right again on the dirt part of River Road which will lead you back to the parking lot. Or, at the point where you emerge on Thundering Book Road, If you want to extend the walk a bit more, turn left and walk another .2 or .3 miles up Thundering Brook Road to the Thundering Brook Falls trail. Follow it to the right to Thundering Brook Falls (see Thundering Brook Falls directions for details) and then on to River Road over a boardwalk that spans the marshland, and back to your car. Or, if you still haven’t walked enough, cross River Road after the boardwalk and continue to follow the Appalachian Trail north. You can go as far as Mount Katahdin in Maine’s Baxter State Park if you’re in the mood. A showy lady’s slipper wild orchid. This gorgeous May (June) afternoon here at the October Country Inn found temperatures climbing into the low 70s. The sun was bright, the sky was blue, and the Maples are about half leafed out. One must take advantage of days like today, get out of the house and take a walk, go for a bike ride, or both. We decided to take a walk. Wild orchids start to appear about mid-May in this corner of Vermont. So, off in search of wild orchids we went. We don’t have to go far, Eschua Bog is known for its wild orchids and, is just a short drive from Woodstock Village. The easily followed, family friendly loop trail is marked by trail signs, with little plaques placed alongside the trail to aid in identifying the many species of plants in the bog. The trail circles eight acres of the wetlands. It can be easily walked in 20 minutes. A boardwalk passes through the heart of the bog, and is the ideal place to get a closer look at the bog inhabitants. This area is very fragile and visitors are asked to only walk on the trails and boardwalk, leave all plants, flowers, and seeds undisturbed, and to please leave pets at home. Dogs can easily damage this sensitive area, and bring invasive plant seeds in on their fur and paws. To get to Eschua Bog from the October Country Inn, proceed east on Route 4. After passing through the heart of Woodstock Village, Route 4 takes a hard turn to the left at the Maplefields convenience store. Go straight ahead at this point on to Hartland Hill road. Follow Hartland Hill road for about 1.5 miles. Turn right onto Garvin Hill road and follow this dirt road for about a mile. You will come to another road that forks off to the right. Just past this fork you will see a small turnoff parking area on the right. Eschua Bog signs will let you know you’re in the right place. The trail is obvious. A small kiosk houses an interpretive brochure to guide you, and asks you to leave the brochure in the kiosk when you leave. Wild mushroom hunting season now begins. It looks like winter is behind us here at the October Country Inn. Onward. Days are longer. Temperatures stay above freezing, and sometimes reach into the 70 degree range. Spring rains are marching across the Woodstock, Killington area. The forest will soon explode in a thousand shades of green. Now is the time to hunt for wild mushrooms, especially the morel. Morels are illusive enough to make their discovery a moment of great joy. You might spend a lifetime wandering the woods without ever finding one. Here are a few tips: Morels are known for their relationships with trees, particularly ash, elm, and old apple trees. Another good place to look is in areas of disturbed ground. Mycelia produce mushrooms in response to environmental stress, so morels are often found around: Areas disturbed now or in the past by water–old flood plains, near rivers, and near washes. Old logging areas or places with lots of downed trees. Burn sites. Morels thrive on the nutrients that burned trees release back into the soil. Soil composition is another thing to consider. Morels are often found in soil that is a mixture of sand, clay, and decaying organic matter. However, above all remember that even if you don’t find any morels, time spend walking in Vermont’s woods is never wasted. For the inexperienced mushroom hunter, a few pointers to keep in mind: Learn how to properly identify morels. There are poisonous false morel look-alikes that can make you sick or even kill you. A good rule of thumb is when in doubt, throw it out. Carry your finds in a mesh bag. Wild mushrooms spread through the dispersal of spores, and the more spores you allow them to drop the better the chances of more mushrooms in the future! Baskets or paper bags don’t allow spores to spread, so find something with large holes in it. Don’t pick every last mushroom you see. It’s tempting. But leave a few so they can continue to drop spores and you and others can enjoy them for years to come. Don’t directly ask someone where to find morels. Any mushroom hunter worth his/her salt won’t tell you anyway. It’s easy to get lost in the woods, especially if you’re looking at the ground for mushrooms. And finally, bring a friend. Don’t wander the woods alone. A pleasant day-hike anytime of year, but especially in November. View of Woodstock village from Mt. Tom. Besides serving breakfasts, morning at the October Country Inn usually finds us hauling out the maps and setting our guests up with suggestions for local hikes or bike rides. Most of the year, there are many opportunities for treks of varying degrees of length and difficulty to choose from. In November, however, a note of caution comes into play. November is deer season in Vermont. Most local deer hunters are very experienced, and very careful about discharging the particular weapon they may hunting with. However, the prudent hiker would avoid hiking in many areas of the woods during hunting season. With that caution in mind, there are November hiking opportunities in areas where hunting does not occur. From the Woodstock green, the Middle Bridge leads to Faulkner Park. Nearby, the diverse trail system of Woodstock’s Marsh-Billings Rockefeller National Park is an excellent example. Although there are many hiking opportunities available in the hundreds of forested acres that comprise this park, one of the most popular is a relatively easy walk to the summits of South Peak and Mt. Tom. The popularity of this three to four mile hike is largely because you can easily begin the walk from Woodstock village. Trail map from Woodstock to South Peak and Mt. Tom. From the Woodstock green, cross westbound Route 4 where Mountain Ave. leads through the historic covered Middle Bridge. Proceed about 3 tenths of a mile along Mountain Ave., past River Road, to Faulkner Park, a small grassy square on the right. Follow any path through Faulkner Park to the back of the park, where you can pick up the trail to Mt. Tom. Although directly uphill, the trail winds up in a series of switchbacks at a gentle grade. Benches are periodically located at the side of the trail. The first overview is at South Peak. From here to the summit of Mt. Tom, the trail gets a bit easier. You can press on for another mile or so to the summit of Mt. Tom, or be satisfied with the view from South Peak. It’s worth the effort in any case. Feed them, and they will come. Bird feeders under our 50-year-old apple tree. Of country life in Vermont’s many simple pleasures we’ve learned to enjoy, a particular favorite is lounging on the October Country Inn’sbackyard deck in the late afternoon and watching the local wild birds dart back and forth among a variety of bird feeders hanging under a 50-year-old apple tree. We are constantly amazed at the variety of birds that visit our feeders. The general rule for feeding any wild animal is: do not feed when it might cause harm. With birds there are few situations in which we can imagine harm being caused, so we say, go ahead and feed the birds. We like to think that, although our feeders may not significantly help overall wild bird populations, it certainly helps the birds in our neighborhood. However, there are other considerations. In the Spring, a time when a generous supply of bird food would be greatly appreciated by the overwintering birds and early arrivals, it is also a time when the local population of black bears emerge from their winter dens in search of food. Backyard bird feeders are an attractive food source for hungry bears during this time of year. This is an example of where feeding a wild animal does it more harm than good. It is not a good idea to encourage bears to mix with humans. Not good for humans, and therefore not good for bears. Black-oil sunflower seeds are high in fat so it provides good energy. Seeds are small and thin-shelled enough for small birds to crack open. White Proso millet is high in protein. Suet cakes are commercially made to fit the standard sized feeder. Nyjer seed is a favorite of finches. We use a sunflower seeds, millet, and cracked corn mix in one feeder, a nyjer seed feeder, and a suet cake feeder. Even if you’re not fortunate enough to live in rural Vermont, hang a few bird feeders out wherever you live. It will provide countless hours of soul enriching pleasure, and the neighborhood birds will love you for it. Take a walk along the Ottauquechee River before breakfast. Returning back down River Road in the Fall. Sometimes, while staying at the October Country Inn, you might wake up early on a beautiful day and want to take a walk before breakfast. Or, you just want to take a walk in the neighborhood without having do drive somewhere first. When we get this urge, Edie and I walk down to River Road for a 3 mile stroll alongside the Ottauquechee River. A Jack-in-the-pulpit alongside the trail. intersection of Route 4 and Route 100A. Follow Route 100A south. Cross the Ottauquechee River bridge and turn left on River Road just past the Bridgewater Grange Hall. Follow River Rd to the east for about a mile. This flat gravel road becomes increasingly less maintained as it narrows into a quiet lane through the woods that closely follows the river. This is a great place to see Orioles in the summer. The road begins an uphill trend that brings you to a intersection with a snowmobile trail that turns off to the right. Continue straight ahead, moving away from the river, into a clearing on a small hill. This road becomes just a faint double-track path over this clearing and continues into mixed woods on the other side. Turn left into the pine woods just as the road turns to the right. Continue following this relatively flat primitive road for about .4 mile as it crosses several small creeks. You will come to a small creek with a markedly short, steep hill that turns to the right at the top. Just before this turn, on your left, you will see a faint but discernible trail that angles off toward the river in the general direction from which you came. Follow this trail through a pine forest as you begin to make a loop back toward the river. You will descend a short but steep pitch as you arrive back at the river. At this point, after crossing a creek, the path turns away from the river and goes uphill for a short distance before merging back with River Road. Turn right and retrace your route back to Route 100A and back to the inn. Heading back toward the river thru the pine woods. An abbreviated, 2 mile version of this walk would be to skip the 1 mile loop section that starts at the intersection with the snowmobile trail, and just walk to that point and return. However, quiet-time-in-the-woods is a precious thing. It may be difficult to acquire if you live in an urban-ish setting. It may be a good part of why you’re in Vermont to begin with. In other words, don’t miss the loop part of this walk, Especially in the late summer and fall. It’s also a great candidate for a snowshoe trek during the Winter.